Auntie B is the same person who would also make Bola-bola (Philippine meatballs) for us, seeing as we're a little frying-averse. On one such fortunate occasion, a year or so ago, I took the opportunity of photographing Auntie B's always perfect-looking turon. 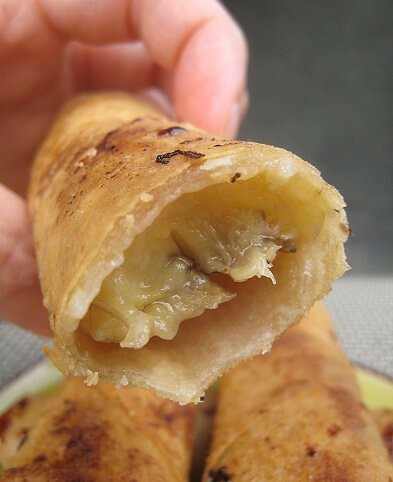 In the Philippines, one would make turon with a different type of banana (or plantain, actually) altogether,called saba, and perhaps add in some langka (jackfruit) as well. But, we have now more or less resigned ourselves to the regular ol' banana. To make them -- not that I've had occasion to with our frying-laziness and Auntie B's generosity -- one simply wraps bananas in egg roll wrappers and fries them up! If you so wish, dredge the banana pieces in brown sugar before wrapping in the wrapper. These turon will be the death of me. If placed before me, I have no choice but to keep eating them until every single one is gone. 2 pieces? Too few. 5 pieces? Um, is there more? 10 pieces? Well, that's quite a lot for a "snack", but they're just too good, bursting stomach be damned. The quantities are completely up to you. Slice bananas lengthwise, if desired. If you wish, dredge banana pieces in brown sugar first. 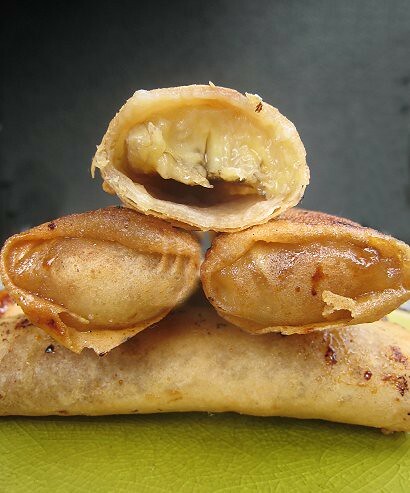 Then, place banana piece on a large egg roll wrapper and wrap. Fold up the bottom to cover the banana, fold in the right and left sides, and roll up until the wrapper is closed. Moisten the top flap of the wrapper to seal. In a pan, heat oil over medium/medium-low heat. 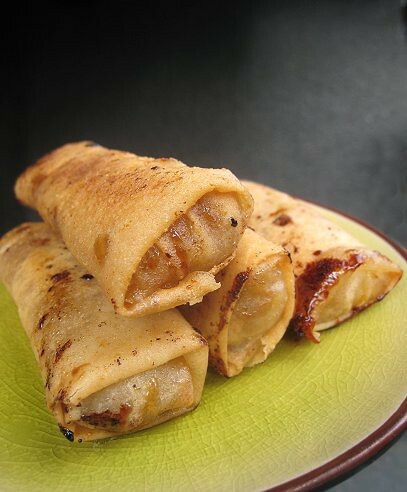 Shallow-fry or deep-fry turon until golden brown. For showcasing BANANAS, we're submitting this post to Weekend Herb Blogging, a world-wide food blogging event (created by Kalyn's Kitchen, now maintained by Haalo of Cook (almost) Anything at Least Once) with the goal of helping each other learn about cooking with herbs and plant ingredients. If you'd like to participate, see who's hosting next week. WHB is hosted this week by Janet of the taste space. Thanks for submitting it to WHB! I think cooked bananas are one of the best creations ever. The depths of their sweetness knows no bounds. These look delicious! What a great way to enjoy them. OMG I want those now! I love deep fried banana delights, from turon to tempura battered and dipped in sugar. Gaaaahyum! However, because I share the deep frying aversion with you guys (or terror...hard to say, really), I only ever eat them at restaurants. Sniff. I wish that I had an Aunt B. It's dangerous to have turon in the house often, because I really have no self-control when it comes to eating them. I always see those in Indonesian or Malaysian restaurants, but I didn't know the name of the dish. You and me both! Especially seeing as these photos were taken about a year ago! Yumm deep fried banana things are hard to resist! Especially if paired with ice cream mmm. Oooh your turon looks fantastic - especially that shot where you show the innards. Yum. Teehee, turon innards. Now that's one innard I like! ooh yumm,going to try this! Hope you enjoy making (and eating!) them. I’d love for you to submit one of your beautiful photos, and a link to your post, to my new baking photo gallery showcasing the beautiful baking, sweets and dessert. Really! I can see these becoming a favorite really fast around my house. A banana wrapped in sugar and egg roll how yum is that! We'll take a look at the site. Thanks for the heads up! My appetite for these appears to be insatiable.